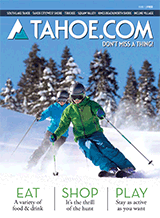 Tahoe is a place where you expect to indulge yourself. Whether you are vacationing here, are a seasonal resident or live in the area all year long, you want to spend your time in a luxurious setting, eat the finest foods and enjoy world-class entertainment. But you may be surprised to learn that this same best of the best experience also applies to the water you drink here. Tahoe water is recognized as being among the best water in the world. And we're not talking about some water in a fancy bottle from the shelves of a gourmet food retailer. No, when you turn the tap on your sink, the water that comes out of the faucet is not only cleaner, safer and healthier than bottled water, but it is also much better for the environment. And, after all, why would you want to drink from a pre-packaged bottle when the water that comes out of the tap is straight from the Lake of the Sky itself? That's right, many communities around Tahoe take their tap water right from Lake Tahoe, famous for its purity and clarity, ranked as the second-deepest lake in the nation and the 10th-deepest lake in the world. The water is drawn from areas far from shore and human activity, deep below the surface. This also means that during periods of heavy rain or high snowmelt, when sediment is carried into the lake, the water intake remains calm and undisturbed. In fact, the lake water is so pure that a number of the Tahoe Water Suppliers Association members are exempt from having to provide filtration to it before providing it as drinking water in the Basin, and there are only about 60 such exemptions allowed throughout the entire country. Lake Tahoe water simply undergoes an ozone treatment process, an ultra-violet light treatment and a small dose of chlorine. Then it comes out of the tap tasting great and at a fraction of the costs, both financial and environmental, associated with bottled water. Not only is the Tahoe tap water more cost effective than bottled water — it comes out to less than a penny per gallon — but the health standards are more rigorous than those of bottled water as well. The Environmental Protection Agency regulations that apply to tap water require a lower level of contaminants than the Food and Drug Administration applies to bottled water. And it isn't just the locals who think that Tahoe tap water is the liquid equivalent of gourmet H20. The Glenbrook Water Co-op was recognized as a gold medal national winner for Best Tap Water by the Great American Water Taste Test, and the Incline Village General Improvement District (IVGID) took first place for Best Tasting Water at the Nevada Rural Water Conference, 3 times since 2011. Since the source of water — Lake Tahoe — is the same for Tahoe Water Suppliers Association (TWSA) members, you can pretty much consider an award for one of these entities to apply to the tap water provided by all of the suppliers. Madonna Dunbar works as a Resource Conservationist with IVGID and serves as the Executive Director of the TWSA and says that the message of “Drink Tahoe Tap” really comes down to getting the word out to people. She strives to overcome the unfounded assumption that bottled water is somehow better than tap, by pointing out the purity of Lake Tahoe water and by enumerating the costs involved in using plastics to shelve and store bottled water, the costs involved in transporting bottled water and the damages to the environment incurred at every step of the process. 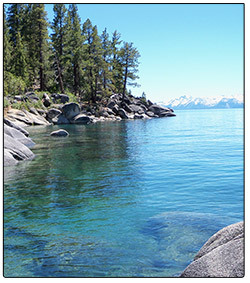 The Tahoe Regional Planning Agency has even recognized her for her efforts with a Lake Spirit Award for demonstrating a strong personal commitment to preserving Lake Tahoe. Her message is gaining traction, and while it might not be as ubiquitous as the Keep Tahoe Blue bumper sticker (and numerous knock-offs and parodies) of the League to Save Lake Tahoe, the Drink Tahoe Tap sticker is not uncommon in the Tahoe region and seems to be closing in on the League's slogan in terms of popularity. In addition to supporting Tahoe tap by actually drinking it, residents and visitors can also help out by working to protect the source of the water, good old Big Blue itself. Some of the guidelines are obvious, such as not dumping trash, chemicals or the like into the water. Others are not so blatant but do make sense, such as picking up after your dog. 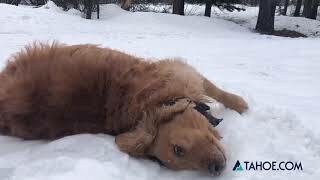 Within a watershed, everything eventually flows toward the water, so being conscientious about your canine friends will help to benefit everyone in the end. The same concept applies to other substances, so consider reducing the use of fertilizer on your Tahoe lawn or commit to using fertilizer that does not contain phosphorus. With just a little awareness and a little education, we can all continue to enjoy gourmet Lake Tahoe water far into the future. It's as simple as turning on the faucet and Drinking Tahoe Tap.